Frailty is common in older age, and there are strong links between frailty and the risk of dying. Older people with frailty are weaker and more delicate. They can experience sudden and dramatic changes in their health when they have an illness or injury. Reducing the risk of falls can help people to live at home, in safety, for longer. 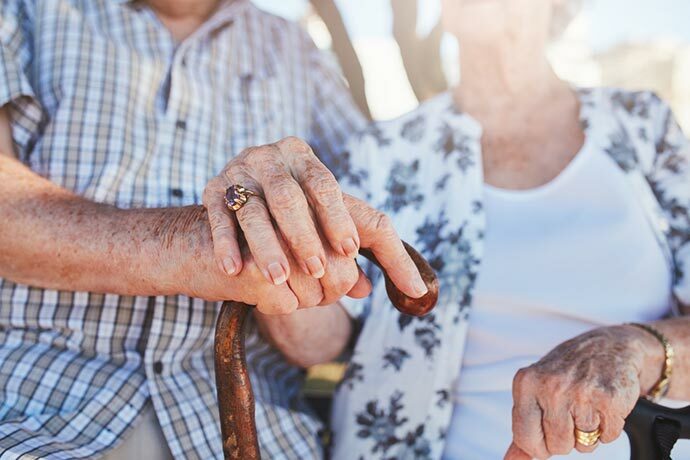 NHS England says that early identification aids targeted support for older people living with frailty. In England, the GMS contract requires GPs to "identify populations at risk of being frail, by degree, using an evidence-based tool supplemented by clinical judgement". 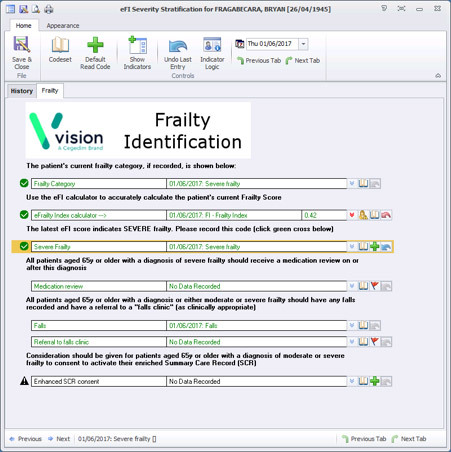 Vision has an Electronic Frailty Index (eFI) calculator and an interactive eFI template. Together, they help you care for your older patients with severe frailty. The eFI report builds a list of your frail patients, grouped by age range and their frailty level. The report makes it easy to identify your patients with moderate or severe frailty, but no eFI recorded. You can look at each patient's record or use the frailty template to decide if you need to review these patients. The template makes it easy to record high-quality data quickly during medication reviews and falls assessments. You can set patient alerts where work is outstanding as well. You can also use the patient list to send review invitations to specific patients. You can print letters, but it's faster and cheaper to send them text messages. Remember that older people with moderate to severe frailty are often housebound, or only able to leave their home with help. You might need to organise home visits for these patients. You can include additional information by changing the patient's consent status to: 'Express consent for medication, allergies, adverse reactions and additional information'. The EFI calculator and template are available on the GPSoC framework, so there is no cost to GP practices. It's easy to assume that only the elderly can be frail. The Lancet has published an article about frailty and pre-frailty in middle-aged people. Their findings are complex but suggest a need to identify frailty and intervene much earlier. Vision's eFI report includes groups of patients under 50 and between 50 and 65 years old. Although the GMS contract only requires you to look at over 65s, you may have younger patients to review as well. CCGs, health boards and public health teams can manage frailty at scale. Download our eBook for an introduction to population-level healthcare management. Published in June 2017, updated in August 2018.